In August 2009, the Board of Trustees of the University of Akron added to the university's employment policy the following proviso: "any applicant may be asked to submit fingerprints or DNA sample for purpose of a federal criminal background check." Although the federal government does not do background checks with DNA, the policy is significant because it highlights a largely unexplored feature of the Genetic Information Nondiscrimination Act of 2008 (GINA). GINA generally prohibits employers from asking for "genetic information." The faculty senate and outside commentators have declared that the Akron policy is "of doubtful legality" because it "appears to violate" GINA. 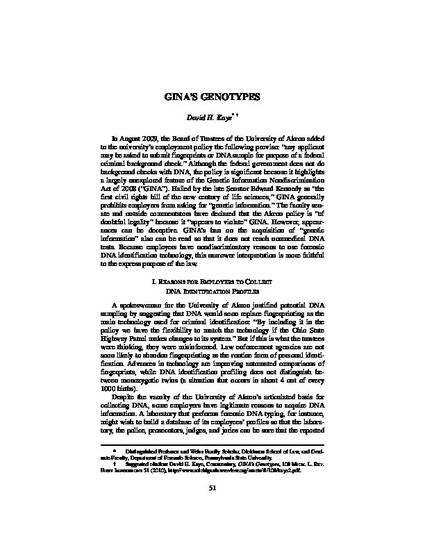 However, GINA's ban on the acquisition of "genetic information" also can be read so that it does not reach non-medical DNA tests. Because employers have nondiscriminatory reasons to use forensic DNA identification technology, this narrower interpretation is more faithful to the express purpose of the law. This article was originally published at 108 Mich. L. Rev. First Impressions 51.